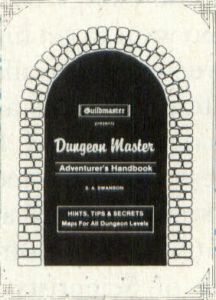 Dungeon Master has the honor of being the top-selling ST program of all time. People by the tens of thousands have ventured into its dank and dreary hallways, though not everyone who has sallied forth has managed to solve the many puzzles that block them from victory. But help is available from many sources, not the least of which is Computer Publications, Unltd. 's Dungeon Master Adventurer's Handbook, a complete guide to this intriguing game. This concise 40-page volume includes complete descriptions of characters, magic spells, combat strategies and monsters, as well as thorough level-by-level overviews of the dungeons, including detailed maps. All objects and puzzles in the dungeons are referenced, with each puzzle's solution included for those who find themselves stuck. The Dungeon Master Adventurer's Handbook is $8.95 and is available at the address below.